Mike’s Challenge – please support! This is a picture of me, Mike Briggs, doing the descent of the International Snowdon Race in North wales 2010. 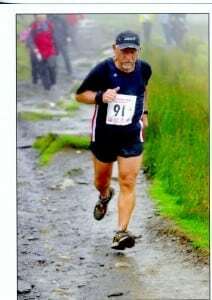 I was sixty nine years old when this was taken, and I have been running such races for many years. Three weeks after the race I was diagnosed with cancer in my throat, up until that time I had no idea there was anything wrong with me. In November and December 2010 I started intensive Radiation and drug treatment which was completed on December 31st. 2011 was then a “blur” of trying to recover and cope with the trauma of what had happened to me. The impact on me and my loved ones lives was devastating. You reach a point when you have to say “I am going to beat this thing” if you don’t then things don’t improve. 2012 saw me improving bit by bit, and my desire to be out running again grew stronger as each day went bye. Eventually in May of that year I went back down to my running club (The Wirksworth RC in Derbyshire) much to everyone’s surprise, and managed a short run with them. Since then I have gradually worked at improving my fitness, and the Oncologists at Chesterfield Royal, and Western Park Sheffield, have examined me on a regular basis, I am still attending sessions with them but they seem very pleased with me. This year 2013 at the age of 72 I am going to take part in two mountain races to support Maggie’s Nottingham, one of these is the Saunders two day Mountain Marathon in the Lake District on the 6 and 7 of July, (go to www.slmm.org.uk for info), and the other is my old friend The Snowdon International Summit race (www.snowdonrace.com), on the 20th of July. Cancer is a terrible curse on the human race and does not discriminate between age or gender, but with the right treatment, after care, and faith it can be beaten in many cases. I have been a lucky man to survive and even luckier to be able to run again. The fact that I’m running again is in no small part due to the loving care and support I received from loved ones and the whole team of medical superstars. Please support me in these races by donating to my chosen charity Maggie’s Centres Nottingham; they all do such a fantastic job with such dignity and compassion.